It would apply to basic rate taxpayers earning under £44,000 where one partner does not use their full personal tax-free income allowance. The £550m a year cost would be funded by a levy on banks. Labour said other families would lose out. Meanwhile the Lib Dems, who called the plan "patronising", have launched their own policies for families. Their pledges include greater flexibility for working parents, more affordable childcare and cheap grants or loans to renovate empty housing. Lib Dem Vince Cable describing business leaders' criticism of the planned National Insurance rise as "utterly nauseous"
Explaining his plans for a married couples allowance, shadow chancellor George Osborne told the Times the policy was about "supporting commitment". "It's not just for married people, it's also for gay people who are in a civil partnership," he said. "I don't preach about people's lives, and many marriages fail, but I think we know now from years of evidence that a society where more people are married is a stronger society." But Prime Minister Gordon Brown said families with children would lose out under the Conservatives. "I am a believer in marriage, and the institution of marriage is absolutely central and fundamental to our society," he told voters in Kirkcaldy. "But what this is about is giving a little with one hand and taking away a lot, because child tax credits for middle class families are to be cut, child tax credits are to be cut, child trust funds are to be cut, Sure Start children's centres for our children are to be cut, the schools budget is to be cut." Lib Dem Treasury spokesman Vince Cable described the measure as "tiny". "It does absolutely nothing to provide an incentive to marriage and it sends all the wrong signals to very large numbers of other people who are excluded from it," he said. Kate Bell, of national single parents' charity Gingerbread, said many of those living in poverty - 40% of whom are single parents - would miss out. "We really want all money that there is to be supporting all families, not just one particular family type," she added. 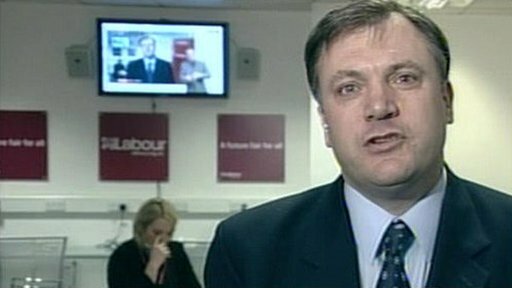 Children's Secretary Ed Balls: "I want to support all families"
The Conservatives say the policy aims to tackle injustice in that UK one-earner families get a "raw deal" because couples in most other advanced countries can transfer tax allowances. They say four million people would benefit, with two-thirds going to families in the lower half of income distribution. The initiative comes at the end of the first week of election campaigning, which has been dominated by arguments over whose future tax and spending plans are more believable. While Gordon Brown has accused the Tories of "spraying around" unfunded tax promises, the Tories have suggested Labour is keeping the truth about the impact of planned tax rises from the public. The Tories would achieve the tax break by allowing some people who are married or in a civil partnership to transfer part of their tax-free personal allowance to their spouse or partner. That spouse would be able to transfer £750 of their personal tax-free allowance to their working partner, which the Tories say will represent a tax cut of about £150 a year for four million people. 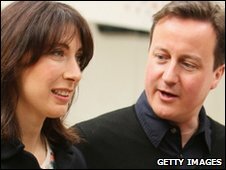 Conservative leader David Cameron has long called for the tax system to recognise marriage but has never before given details. The Tories say the independent Institute for Fiscal Studies (IFS) has judged that the policy would cost £550m annually. The Conservatives' commitment is to introduce the tax break during the next five-year parliament but they say they hope to introduce it in next year's Budget. This is when they expect to introduce the bank levy which they hope will raise about £1bn a year by taxing risky borrowing. The rest of the money raised from the bank tax will go towards paying down the deficit. 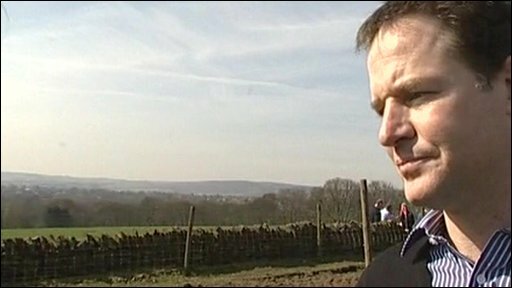 Nick Clegg says Conservative marriage tax plans are "patronising"
Conservative sources said the tax break was designed to be a "symbol and message" that marriage was supported by the tax system. But critics will say that it encourages one partner to stay at home and not work, and nor does it target help to children. The IFS said 32% of all married couples were likely to qualify for the rebate but it was unsure people would choose to get married or stay together because of what was being offered. "The incentives to marry - or not to divorce - provided by a policy whose maximum benefit is £150 a year must surely be weak relative to the other costs and benefits involved," it said. It also suggested the plan would be "costly" to administer and there were simpler ways to help married couples on low and average incomes.